Free Guide: How do Google Ads work? Adwords lets you put small text ads in front of people who are searching Google for your products or services. For example, let’s say you are a plumber in Lancaster, PA. With Adwords, you could create an ad for your business that would appear whenever someone in the Lancaster area searches for the word “plumber” in Google. You only pay when someone clicks on your ad, regardless of how many times it appears. The cost of each click varies based what you’re advertising and how many other businesses are targeting the same keywords. Other factors that affect the cost include the quality of the ad copy, the relevance of the keywords, the page that people see after clicking on your ad and the numerous settings within your Adwords account. This is why it’s so important to use skilled Adwords specialists to manage your account for you. You control how much you spend. Let us maximize your ROI. Because of the complexity of the Google Adwords system, it’s critical to use professionals. Copy Army help businesses generate bigger results from Adwords, for less money. We offer straightforward pricing for our Adwords management services, based on your ad spend. 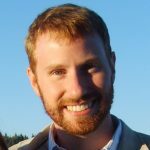 Led by Search Marketing Director Mike Marlin, we’ll help you reach more people online and turn them into paying customers. Want to get started right away? 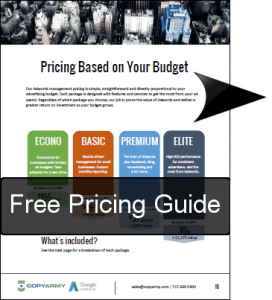 Fill out the form to request our free pricing guide or email ppc@copyarmy.com. We look forward to launching your Adwords campaign!